When we read or hear the words dental tools, we sometimes get a little bit freaked out, but not to worry. The dental tools that we use in our professional cleanings don’t hurt. Belvedere Family Dentistry is one of the best dentist office’s in Charlotte, North Carolina. We make sure you are completely satisfied with your care before you leave the office. We take pride in our work and most of all we strive to give you the best dental care possible. In this article we will be discussing what type of dental tools we use for our professional cleanings. As dentists and dental hygienists, we aim to remove plaque, tarter and stains that have built up on your teeth. Even if you brush and floss your teeth and gums regularly each day the tarter can still build up on your teeth. Getting a professional cleaning is an important part of great oral hygiene and is really needed to help your teeth stay clean and tarter free. We actually recommend that you come into the office for a dental cleaning once every 6-12 months, so that way we can prevent periodontal disease from progressing. We ask that you to still maintain good oral hygiene at home in between cleanings to help reduce the buildup of tarter. Here is a list of the dental tools that we will be using to clean your teeth. · Depending on how much tarter and plaque is on your teeth, we will be using a dental tool called an ultrasonic. What this does is that it vibrates your teeth to break up and remove the tarter and plaque that’s on your teeth. · After we use the ultrasonic and all that plaque is loose, we will be using a scraper to scrape off all the remaining buildup of plaque and tarter that’s on your teeth. · Next, we will be using a polisher that is electric. What this does is after your teeth have been scraped and all the plaque is removed we will polish them. The polisher will have a gritty paste applied to it and then the paste will be massaged onto your teeth. After the polishing is done your teeth will feel really smooth and clean. · We will then use a dental tool that is called a saliva ejector. The saliva ejector removes the remnants of the process and will also remove the saliva that you have built up. 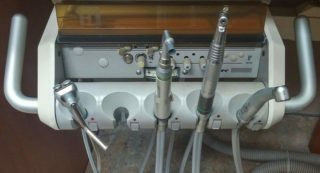 · The last dental tool that we will be using is fluoride. We will gently apply fluoride to your teeth so it can help strengthen your enamel and will also help prevent tooth decay. So now that you have an understanding of the dental tools that we will be using for your cleaning, give us a call and make an appointment with us. Here at Belvedere Family Dentistry in Charlotte, North Carolina, we look forward to helping with all of your dental needs.